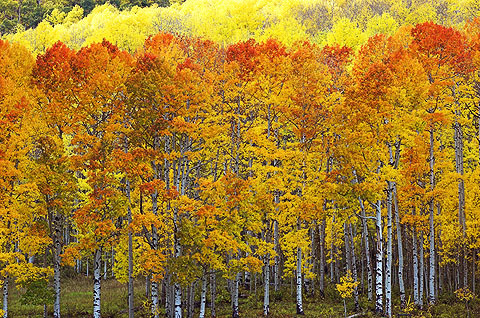 Quaking Aspen Trees are beautiful faster growing native trees that are very cold hardy. Quaking Aspens have green heart shaped leaves in the summer that turn to a brilliant yellow-orange during fall foliage. The Aspen tree is sometimes called Trembling Aspen or Quaking Aspen because their leaves tremble in a light breeze. Aspen trees grow fairly straight and upright. The Populus tremuloides is a native deciduous tree that can grow from 20 - 50 feet in height with a canopy spread of 20 feet. Aspens grows best in full sun. This tree has a high water requirement and needs a moist site to do well but it is has a moderate tolerance to salt and alkali soils. The Aspen tree is a medium tree perfect for farmstead windbreaks and natural plantings. Quaking Aspen ships as 1 to 2 foot tall bare root dormant plant. 1 Plant per order. Please note: this item generally ships in spring only.